Quester® has launched a new website at http://developers.quester.com/. 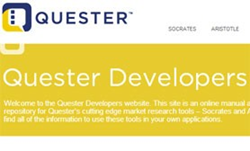 The Quester Developers site is designed for IT developers and programmers interested in interacting with Socrates®, a software-based interviewer, and Aristotle®, a text analytics engine. “On the Quester Developers website, [developers and programmers using the Socrates ITB, Socrates API, or Aristotle API] will find documentation, examples, and technical data regarding Socrates and Aristotle”. “On the Quester Developers website, [developers and programmers using the Socrates ITB, Socrates API, or Aristotle API] will find documentation, examples, and technical data regarding Socrates and Aristotle”, writes Jereme Thomas, IT Director at Quester, in his July 12, 2013 blog post: http://www.quester.com/blog/quester-developers-website-launched. The launch of the new site follows a series of software upgrades on Socrates and Aristotle, which the IT Quester team performed and implemented in March 2013. With mobile and social media integration now possible with Socrates, companies can gain feedback through their web-portals and social media portals, such as Facebook. Aristotle’s capabilities have been expanded to allow for larger volumes of qualitative data to be processed at faster speeds, further establishing Quester’s technology expertise in the field of market research. Socrates, the world’s-only software-based interviewed, was developed by Quester and launched in 2002. To date, the software has conducted over four million one-on-one interviews. Aristotle is Quester’s proprietary text analytics engine launched in conjunction with Socrates to identify key themes and ideas found in large volumes of qualitative data sets. Quester® is a technology-driven full-service market research firm, recognized as a 2012 EXPLOR Award finalist. We have developed proprietary technology that allows us to conduct qualitative research on a quantitative scale, or Quali-Quant research, all with multi-lingual capabilities.